It was ride and drive time as new diesel vehicles were on display at this year’s conference. 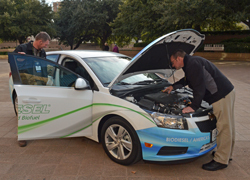 National Biodiesel Conference attendees put some of the latest diesel vehicle models to the test on Wednesday January 21st during the 2015 Biodiesel Ride-and-Drive Event outside the Fort Worth Convention Center. The event featured a sampling of some of the many new biodiesel-capable models available in 2015, including the popular Chevy Cruze diesel sedan, a 2015 Volkswagen Beetle TDI, a 2015 Ford F250 SuperDuty pickup, a 2015 Ford Transit van, and the 2015 Hino 195h DC – a medium duty double cab diesel electric hybrid truck. Representatives from these companies were on hand to answer questions too.